"It's becoming harder and harder to kill ’em." 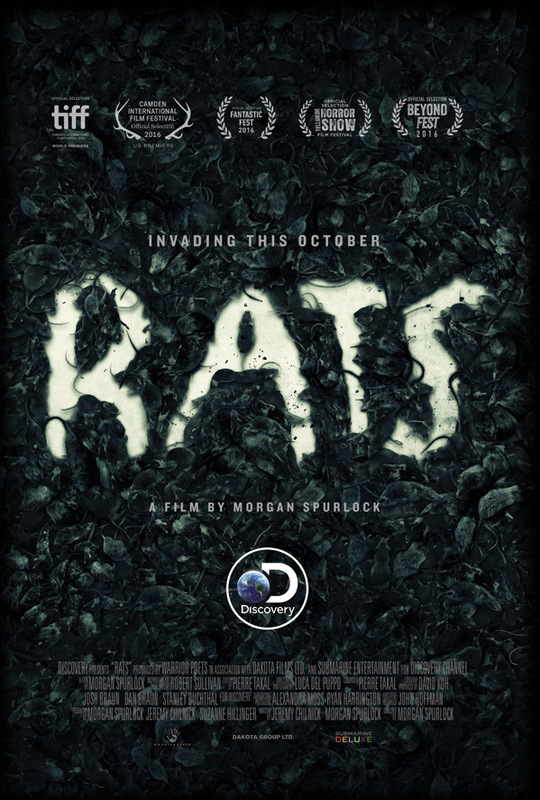 Discovery Channel has debuted the first official trailer for Morgan Spurlock's latest documentary titled Rats, and it is indeed about rats, the creepy little (or actually pretty big) vermin that live under our streets, eating our garbage, spreading disease. The doc is premiering in the Midnight Madness section of the Toronto Film Festival this week, which is perfect for this kind of film. While it's based on the book about rats in New York City, Spurlock's doc examines the history of rat infestations in major cities throughout the world. I'm a big fan of Spurlock and his documentaries, and this looks like it's going to be freaky and fun. Thankfully as viewers we won't have to get anywhere near any rats, but be prepared there are some seriously disgusting shots in this. But I still want to see it - looks fascinating. Inspired by Robert Sullivan's NY Times bestselling book, RATS goes deep beneath the surface to explore the lives of man's greatest parasite. Oscar nominated director Morgan Spurlock unveils a new form of documentary horror storytelling, journeying around the world to bring viewers face to face with rats while delving into our complicated relationship with these creepy creatures. Rats is directed by acclaimed documentary filmmaker Morgan Spurlock, of the films Super Size Me, Where in the World Is Osama Bin Laden?, The Greatest Movie Ever Sold, Comic-Con Episode IV: A Fan's Hope, One Direction: This Is Us previously. The film will premiere in Midnight Madness at the Toronto Film Festival this year. Spurlock's Rats will first invade in theaters in a special midnight event at Landmark Theatres on September 23rd this month, before arriving on Discovery Channel starting October 22nd. Who's ready to learn about rats? Welp, I'm completely unnerved now. Which of course means I have to watch it. I'm sure it'll make at least one appearance. Euuuugghhhhh. Never more than 10ft from a rat at any time, is that not the saying? Looks good. They are resilient little buggers. I don't have to watch this, I had a chance to be convinced that fight against rats is longstanding.